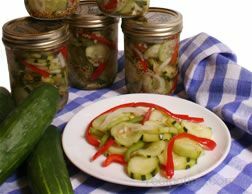 Cover whole cucumbers with boiling water in a crock or heatproof container. Allow to stand until next day. Drain and repeat this process for the next 3 days. On fifth day, drain and slice into 1/3 inch pieces. After sliced, put 1 tbsp. Alum in enough water to cover. Let stand overnight. Drain. Combine the sugar, salt, spices and vinegar in a large saucepan. Add green food coloring for nice green color. Bring to boil and pour over slices. Let sit 2 days, reheat, and put in jars to seal.